This month’s 1091 Project could more appropriately be called the “0 Project” because, instead of our usual 1,091 miles apart, Conservator Beth Doyle of Duke University Libraries and I were both in the same place for the FAIC-sponsored “Master Studies” Workshop: Conservation of Transparent Papers held July 23-24 and 25-26, 2012, in Ames, IA. Hildegard Homburger usually teaches this workshop in her home city of Berlin, and this summer marks the first time she has come to the U.S. to teach it. 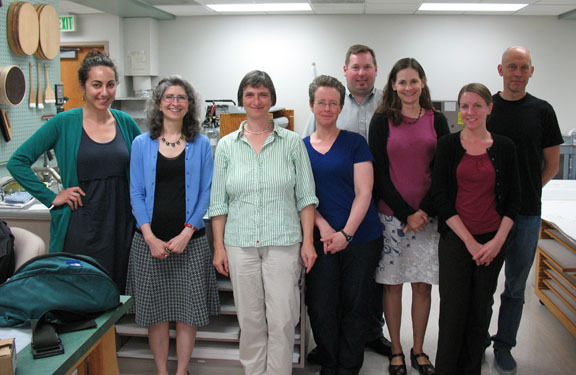 The week before coming to Iowa State University Library, Hildegard taught the workshop at the Smithsonian Institution Archives. Nora Lockshin has posted about the SIA workshop on their blog The Bigger Picture. Hildegard Homburger addresses participants from session one at Iowa State University Library. Iowa State University Library was pleased to offer a second location for the workshop in the Midwestern portion of the country. We are lucky to have a spacious and well-equipped conservation lab located in our beautifully designed main library, just steps away from Special Collections and Archives. Landscape Architecture is one of ISU’s strengths, and we hoped that our park-like campus would provide a pleasant environment for our visitors. We had a wonderful time hosting the workshop. Abigail Choudhury of FAIC patiently helped us through the process, and was very responsive as we communicated back and forth about supplies, equipment, transportation and housing for Hildegard, and all the other necessary details to make the event run smoothly. 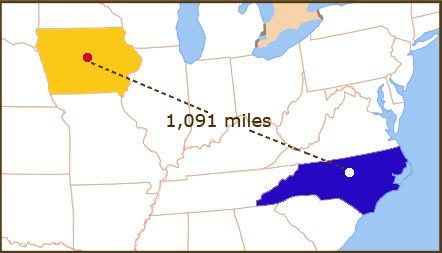 The Midwest is a big, spread-out area, with lots of rural space between major cities, so Midwestern conservators don’t have the luxury of gathering for lectures and group meetings as frequently as our East Coast counterparts. Events like this one help us build our sense of larger community. Our participants came from all over — the Midwest, of course, but also Canada, California, Texas, and even the East Coast. 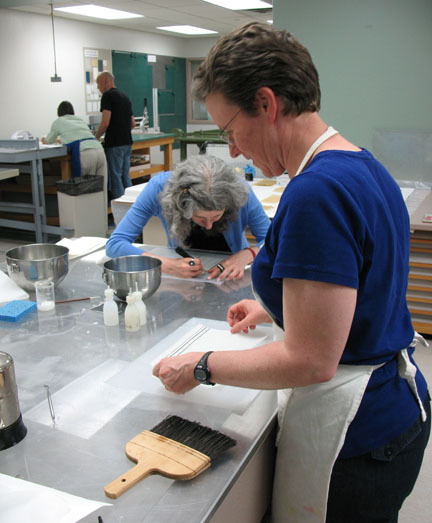 The types of conservators in attendance ranged from library/archives to museums to private practice. I personally really enjoyed everyone’s openness and the engaging conversations both in class and during coffee breaks and meals. I found the advanced nature of the course material rewarding, and Hildegard certainly turned many of our preconceived expectations about the behavior of transparent paper on their heads. For example, where I would have expected to use more humidity to force a misbehaving sheet of transparent paper to bend (er — actually, to flatten) to my will, Hildegard used much less humidity and coaxed the paper into submission with repeated flattening cycles in a hard-soft sandwich. An unexpected pay-off balanced the extra work of hosting the workshop: our volunteer Martha and I each attended one workshop and “audited” the other. Although I actively participated in only the first session, I was on hand to take photos during the second session and to observe Hildegard and the other participants at work. I also enjoyed getting to participate in discussions and ask more questions the second time around, which really helped me to fill in the gaps in my notes from the first session and internalize the material that much more effectively. Hildegard was incredibly generous with her knowledge, sharing treatments that had gone terribly awry for her in the past as well as those treatments that had gone right. One of the things I appreciated most about Hildegard’s teaching style is that she presented us not only with the methods and materials that work best for her, but also with alternative options so we could play around with them and make up our own minds. So, while she brought isinglass and Japanese long-fibered tissue for us to use, she also had us try our hands at mending with four different types of pre-prepared heat-set tissue: Cromptons, Beva, Filmoplast-R, and Lascaux 498 HV. Isinglass is Hildegard’s adhesive of choice when mending transparent paper, and she certainly had me convinced by the end of the workshop — not because she had insisted on it, but because she had given me options and guided me to figure it out for myself. Visit our photo album of the workshop on Flickr to see images of instructor Hildegard Homburger and the other participants in action. 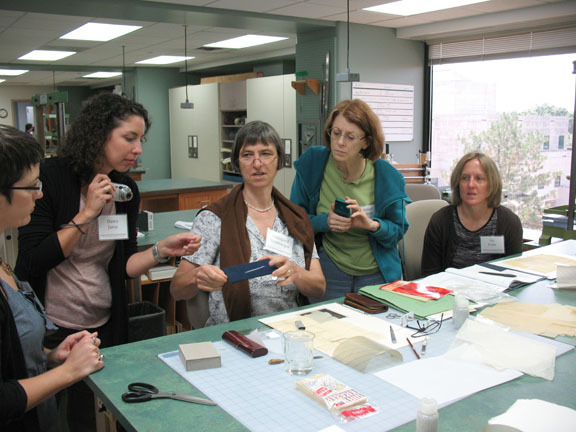 Don’t forget to head on over to Preservation Underground for Beth Doyle’s impressions of the workshop as a visiting participant. And many thanks to everyone who contributed to and attended the workshops. 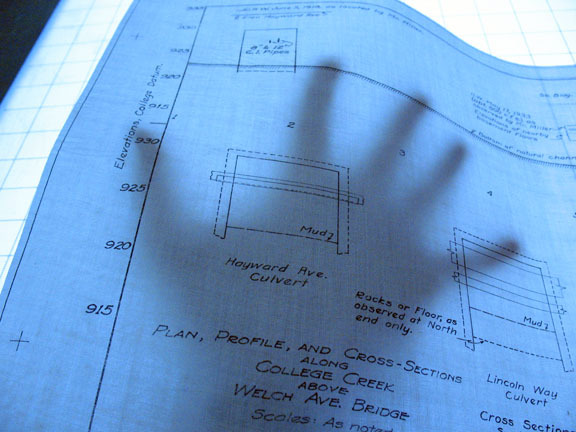 The plans remaining from last August’s flood include more than twenty on tracing cloth. Tracing cloth is a woven cloth that is transparent enough to use in place of tracing paper. 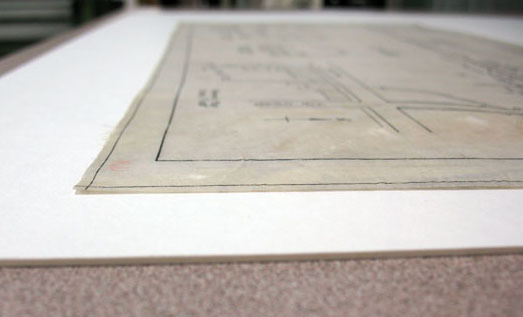 The cloth is much more durable than tracing paper and often served as a master copy used to make blueprints and other reproductions. Tracing cloth is heavily sized with starch and is usually quite glossy and smooth, unless of course it sits in flood water for a day. The cloths I am working on have lost much of their size and have become quite wrinkled. In a few cases, the wrinkling is serious enough to obscure the information. I would prefer not to wet the cloths again because the images could be lost or smudged, but they all have visible flood residue on them which needs to come off. Wiping the plans with a soft cloth soaked in a mix of water and denatured alcohol removes most of the flood residue, but drying the slightly damp cloths between blotters doesn’t completely solve the wrinkling problem. I’ve worked with transparent paper in the past and wondered if the hard-soft sandwich introduced by Hildegard Homburger and Barbara Korbel for flattening tracing paper would work on tracing cloth. 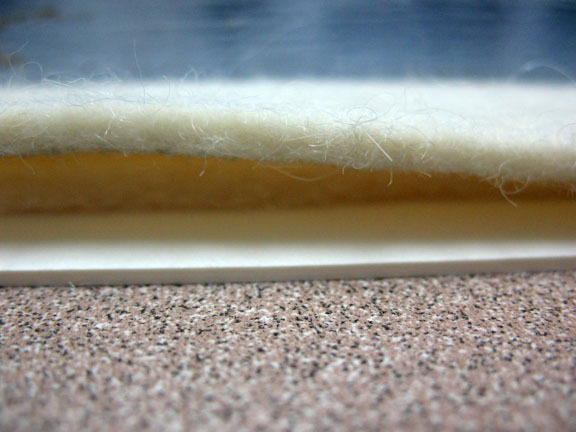 A hard-soft sandwich presses your object between a hard support on the bottom, in this case a piece of mat board, and multiple layers of drying felts which are quite soft. The sandwich does an amazing job with tracing paper, and I’m happy to say that it does a pretty impressive job with tracing cloth as well. 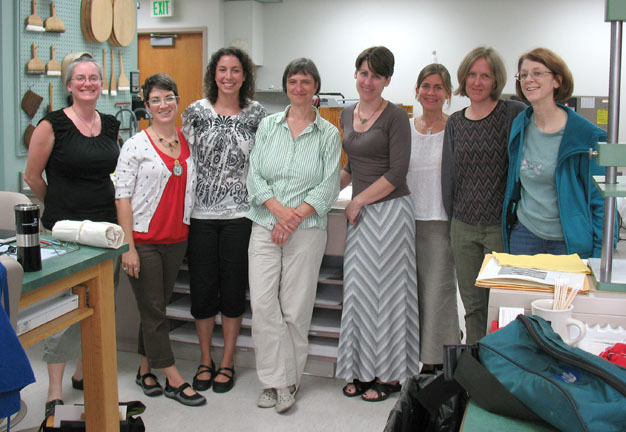 Preservation Clinic: Ask the Experts! A special public event hosted by the Preservation Department of ISU’s Parks Library in honor of National Preservation Week. It will be a little bit like Antiques Road Show, but for preservation advice not for appraisals. People bring their old family stuff and ask about how to best preserve it. We hope to see you there with your stuff! “Disasters Happen” Preparation & Response Training workshop in Cedar Rapids, IA. Funded by an IMLS Connecting to Collections Grant. $30 one day/ $50 both days. Lunch included. Registration deadline: April 10. Click here for schedule and registration information. 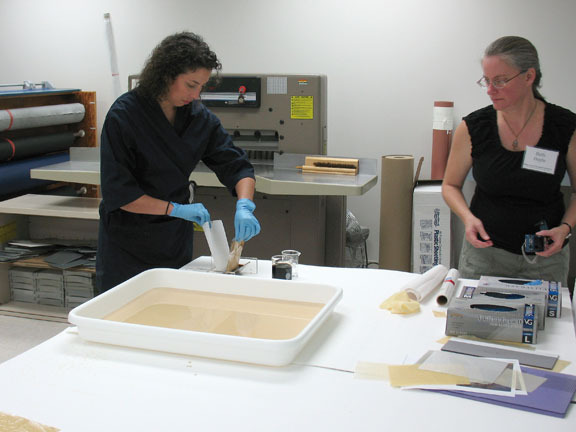 Preservation Clinic: Ask the Experts! The Iowa State University Library Preservation Department will host a Preservation Clinic in the lobby of Parks Library (outside the Fireplace Reading Room) to celebrate Preservation Week. Bring in your treasured family photographs, documents, or artifacts to receive a free preservation consultation! Or just drop by to learn more about the department’s mission and how you can support preservation at ISU. Open to the public. Tuesday, April 24, 2pm-4pm; Wednesday, April 25, 11am-1pm; Thursday, April 26, 2pm-3pm; and Friday, April 27, 8am-10am. Taking Care of Family Textiles. The ISU Library Preservation Department will host a viewing of this webinar with objects conservator Bronwyn Eves discussing various types of family textiles, such as clothing, flags, furniture coverings, and framed textiles. Tuesday, April 24, 2012. 1:00 pm CST (session lasts 1 hour). Room 192, Parks Library. Preserving Your Personal Digital Photographs. The ISU Library Preservation Department will host a viewing of this webinar with Bill LeFlurgy discussing practical tips and tools for keeping your digital photographs safe as technology changes. Thursday, April 26, 2012. 1:00 pm CST (session lasts 1 hour). Room 192, Parks Library. 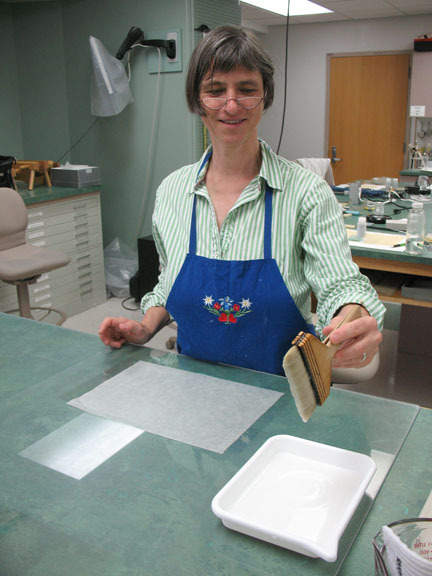 AIC Master Studies Workshop: Conservation of Transparent Papers with Conservator Hildegard Homburger. $350 for AIC members/$500 for non-members. Partially funded by the National Endowment for the Humanities (NEH). Scholarships available through FAIC and NEH. Registration deadline is June 15, 2012 or when the course is full (enrollment limited to 6 per two-day workshop). Hosted by ISU Library, Ames, IA. Click here for course details, scholarship application links, and registration information. You have searched the archives for Hildegard Homburger. If you are unable to find anything in these search results, you can try one of these links.